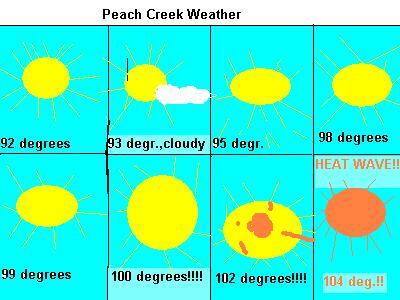 Freak Virus Invades Peach Creek! It was a strange sight here in Peach Creek today. Indeed the cul-de-sac, instead of being teeming with kids, was empty today. No Kevin, no Sarah, no Eds, no Rolf, no one. It was as if some strange illness had affected the area (again). The cause of this illness is uh.....unknown at the present time. Though I firmly believe that it was caused by...jawbreakers...yes. You know, since the candy stores were handing out free jawbreakers, it only stands to reason that the kids ate too many and got...sick. Yes that's it! Yes....all is quite. It's not my fault! ps.- It appears that my first observation was somewhat inaccurate, as I have stumbled upon a normal looking Ed. When I asked him if he was feeling alright, he replied, "As soft as a pair of bunnies." Okay, then. It appears that my...that is the illness affected everyone but Ed for some strange reason. Well that's all my observations for now. Rent-A-Crane has announced that they're doing a total recall on all toy crane machines in the Peach Creek area. Reports are coming in that the crane machines aren't making as much money as they should. Also it has been discovered that the prizes inside are covered in radiation. No clue how they could be but the tests don't lie. The total amount of profits made was about one hundred dollars and fifty cents. When the kids of the culde-sac were asked about this they had this to say. "I can't believe this! How could someone be so blind?" Edd "I wish I thought of that." Eddy "What were we talking about again?" Ed The Rent-A-Crane company estimates that this will set their business back at least two hundred thousand dollars. They apologize for this inconvenience saying that they didn't know that kids didn't like radiation. Since the toys located in the Rent-A-Crane company's machine were found to contain radioactive toys (see above), a large number of complaints have been filled against the company. After obtaining a list of the complaints that have been filed, I decided to track down a few of the complainees to see what their problems were. First on the list was Johnny. Upon approaching Johnny nothing seemed out of the ordinary, besides his freakishly large head, which had always been taht way. When I asked him what was wrong, he exclaimed, "Look what those toys did to Plank!" Indeed, I saw what appeared to be a rod of pure, pulsing, green energy. I quickly shielded my eyes and looked away. "Good luck with your problem," I muttered as I walked away, trying to regain my vision. Next on the list was Kevin. As I walked up to Kevin I immediately noticed something was wrong, but I couldn't quite put my finger on it...His bike. Mysteriously absent. I looked around. His bike was nowhere to be seen. When I asked where his bike was, he threateningly responded, "Can it! Those stupid toys melted my wheels. Now I have to buy new ones! When I find those Eds, I'm going to pound them!" Last on the list was surprisingly...Ed. Upon first observation, Ed seemed perfectly normal. A second observation revealed nothing out of the ordinary. When I asked Ed what was wrong he showed me a belt wrapped around his waist and exclaimed, "Look at my tail!". In conclusion, it is my opinion that these complaints will go to court and most of them will probably win. I do not feel, however, that any of them will get any money because Rent-A-Crane will most likely file for bankrupcy. why is kevin always with that stupid bike? his girlfriend! what is the deal with him? why is he so obsessed with it? hes also over-protective of it too. Wednesday: High of 98 chance of rain 99% Conditions:Clear in the morning then increasing clouds throughout the day. Saturday: High of 102 chance of rain 20% Conditions: Clear, HEAT WAVE ADVISORY! Having problems? need someone to talk to? and it only costs 50 cents a visit!